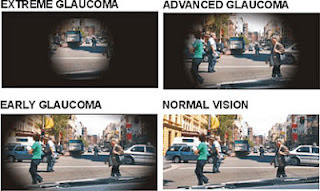 Eyes and Vision, An Eye Doctor's View: So What Exactly Is Glaucoma? So What Exactly Is Glaucoma? Glaucoma is a disease that can cause vision to be permanently lost very slowly over time. The disease starts by enlarging an individual’s “blind spot,” then may progress leading to complete blindness. Glaucoma is sometimes referred to as “the silent thief of sight” because a typical person would have absolutely no symptoms in the early stages of the disease, and would only notice after it was too late and the damage was done. The disease essentially attacks the optic nerve in the back of the eye. Typically high pressure inside of the eye - the Intra Ocular Pressure, or IOP - causes this damage. The number one risk factor for glaucoma is a family history of the disease, but glaucoma may affect anyone. As with most diseases of the body, the earlier the findings are caught, the more we are able to do. With modern medicine, it is rare that any new case of early glaucoma caught progresses past the “early” stage. How Do I Know if I am at Risk or Have Glaucoma? No drops or air puff to measure pressure! Annual eye exams. Many eye doctors today are equipped with advanced instruments that allow us to catch the earliest signs of elevated eye pressures and damage to the optic nerve. Carillon Vision Care has multiple instruments to check the pressure, and has the most advanced optic nerve imaging instrument available: the Optical Coherence Tomographer, or OCT. The OCT technology measures every attribute of an optic nerve in micrometers (one-thousandth of a millimeter!). This allows us to know ABSOLUTELY if any damage is present. I Am Told I am a “Glaucoma Suspect.” What is That? A Glaucoma Suspect is a medical diagnosis. This typically means that there is either high eye pressures with no optic nerve damage, or the optic nerve looks suspicious for possible damage. A Glaucoma Suspect may never actually go on to develop the disease, but we watch these patients very carefully. Treatment is initiated only when we are certain that there is early damage. Okay, I Have Glaucoma. How is it Treated? A number of ways. 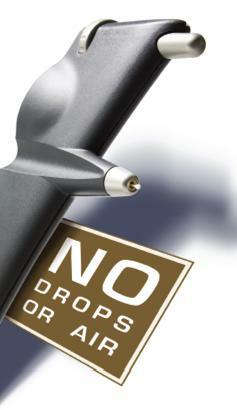 The first line of treatment is typically to lower the eye pressure by using prescription eye drops. Usually 1 drop once per day is enough. Our doctors carefully review all of the new research to make sure we use only the best type of medication for each particular patient. The very first generic glaucoma medication came out a year ago, Latanoprost. All other brand name glaucoma medications are very expensive. 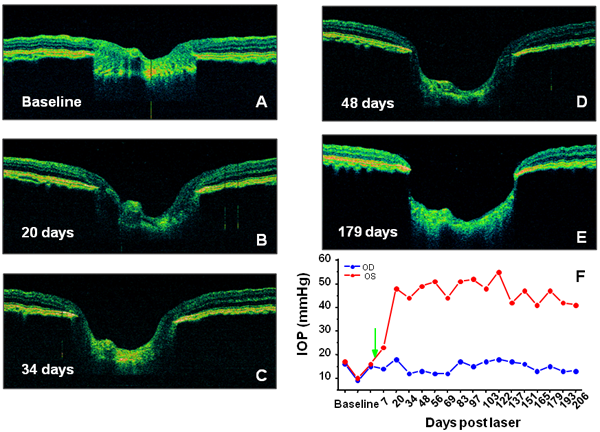 All of the 1 year published studies on Latanoprost confirm the medicine is just as effective as the name brand, and our doctors have a number of glaucoma patients responding very well to this new formulation. When these drops are not enough to lower the pressure, there are a group of simple laser surgeries that are effective for most patients. These lasers essentially increase the drainage channels inside the eye helping lower the pressure. The take home message here is preventative care. If you or a loved one does not require corrective lenses and has not been in for an eye exam for a while, the time is now. 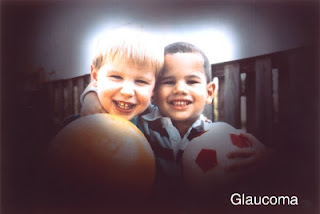 If you would like more information on Glaucoma, or any other common eye disease, check out www.allaboutvision.com. Serious glaucoma impacts the greatest amount of those experiencing glaucoma. It cannot be treated, but it can be handled - with close help from doctors. It is complicated disease and second most common cause of blindness seen in the USA. To treat glaucoma timolol eye drop can be used which is the first beta blocker approved for topical use in treatment of glaucoma in USA. That is correct, Jack. Most Physicians today would agree that the first line ophthalmic drop would be part of a class known as "Prostaglandin Analogues." Timolol, a "Beta-blocker," I typically use as a second line in conjunction with the first when the first line drop is not enough. As with any Rx medication, there are contraindications and side-effects. All Glaucoma & Glaucoma Suspect patients should be under the direct care of a Therapeutically licensed Optometrist or Ophthalmologist. Thank you for sharing this useful information in terms of glaucoma! Some people suffered because of this disease and my grandfather as well, as we talked to the Physician glaucoma has different kinds of treatments such eye drops and most effective is the surgery. You're welcome! Correct, Rx eye drops are the first line and are typically the simple, easy, and effective treatment in the Glaucoma cases that have a lower risk of progression. Surgical techniques are becoming more commonplace with the availability of ALT & SLT (relatively simple laser procedures that essentially induce a type of drainage mechanism to lower pressure) and newer advances in true surgical glaucoma implant devices. Every glaucoma case is unique. Thank you for the tip on how to know if I have glaucoma or not. I will have to make an appointment with an eye doctor to check my eyes and make sure nothing is wrong. I have a friend who has glaucoma, and is having a hard time accepting it. Since my friend unexpectedly got it, I want to make sure my eye's are alright. I haven't been to an eye doctor for a long time, so I hope nothing is wrong. I am from USA, I was diagnosed of Emphysema (COPD) in 2015 and I have tried all possible means to get cured, i even visited pulmonologist but all to no avail, until i saw a post in a health forum about a herbal doctor from south Africa who prepare herbal medicine to cure all kind of diseases including Emphysema, at first i doubted if it was real but decided to give it a try, when i contacted this herbal doctor via his email he sent me the Emphysema herbal medicine through courier service, when i received this herbal medicine, he gave me step by instructions on how to apply it, when i applied it as instructed i was totally cured of this deadly disease within 12-14 days of usage, if you are suffering of this diseases you can as well Contact this great herbal doctor via his email abumereherbalcentre@gmail.com.